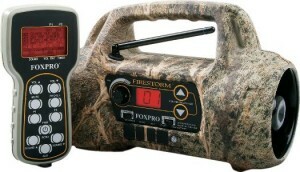 The Foxpro Firestorm Digital Game Caller comes preloaded with 50 high-quality sounds and is capable of storing 200 sounds. It handles multiple file formats (MP3, WAV, FXP). Along with its lightweight portability, the digital circuitry delivers loud, clear sound with dual speakers. (both a horn speaker and a cone speaker). Includes the multi-functional, backlit TX-9 remote control. Two custom sound preset buttons allow you to store sound presets with individual volume levels. Red backlit display and glow-in-the-dark keypad for optimal night operation. Load calling sounds from your computer via the USB 2.0 port. The Firestorm’s two external speaker jacks allow for even greater volume. Remote uses one 9V, caller uses 8 AA batteries (not included). If you are a coyote hunter, the Firestorm also features Foxpro’s Foxbang technology which will switch the sound automatically after a gunshot to the sound you have preset ahead of time. This means the caller can automatically switch to a pup distress or ki-yi sound after the first shot to entice additional coyotes in to your setup. I don’t own a Foxpro Firestorm, but I did check all of the online retailers for Foxpro Firestorm customer reviews and nobody had anything bad to say about it. The reviews at Amazon, Bass Pro Shops and Cabela’s were all consistently positive. With over 25 total customer reviews, the Firestorm scored 4.6 out of 5 stars at both Bass Pro and Cabela’s and 5 out of 5 stars at Amazon. If I was in the market for a new electronic caller, the Firestorm would be on my list. The Foxpro Firestorm digital electronic caller is available from several online retailers, including Cabela’s, Bass Pro Shops and Amazon.com. We would like to invite you to review the ICOtec GC300 Electronic Game Caller. 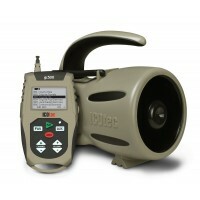 It offers simply controls, does not require programming, very loud (15 Watt 120dB speaker), crystal clear audio calls by Wildlife Technologies, up to 300 yard remote control range, can play 2 calls simultaneously, 12 field proven and most popular calls on the market and only costs around $70. I’m willing to review any game caller or predator hunting product. You can contact me here.